Lindsay Wagner Interview: "The Human Potential and Emotional Thing Has Always Fascinated Me"
Lindsay Wagner first came to prominence in the critically-acclaimed role of Susan Fields in The Paper Chase (1973) opposite Timothy Bottoms and John Houseman. However, she received household recognition worldwide on television as Jaime Sommers in The Bionic Woman, airing for three seasons beginning in 1976. Wagner also portrayed this character in the 1970s series, The Six Million Dollar Man, and later reprised the role of Jaime Sommers in several TV movies. Other TV appearances include Adam-12, Owen Marshall: Counselor at Law, Marcus Welby, M.D., Scruples, The Fall Guy, Shattered Dreams (TV movie), Once in a Lifetime (TV movie), Bionic Ever After? (TV movie), A Mother’s Instinct (TV movie), Sins of Silence (TV movie), Warehouse 13 and NCIS. Film appearances were Nighthawks, High Risk, Martin’s Day, A Light in the Forest and Billy: The Early Years. Wagner has authored several books, and in recent years has given seminars and workshops for her self-help therapy, “Quiet the Mind and Open the Heart,” which promotes spirituality and meditation. Building on its successful Love Finds You franchise, the original UP movie, Love Finds You in Valentine, a sweeping romantic drama set in scenic Nebraska, will premiere on Valentine’s Day, February 14, 2016. The film stars Wagner, Ed Asner, Diogo Morgado and Michaela McManus. Melissa Parker (Smashing Interviews Magazine): Lindsay, it’s great to chat with you today! Lindsay Wagner: Thank you! What part of the country are you in? Lindsay Wagner: You sound like it (laughs). Melissa Parker (Smashing Interviews Magazine): (laughs) Let’s talk about Love Finds You in Valentine. How did you become involved in the project? Lindsay Wagner: It was kind of a typical inquiry to my agent asking, “Would you want to do this movie? We’d love to have you play the mom.” I read the script and loved it. Melissa Parker (Smashing Interviews Magazine): Tell me about the film. 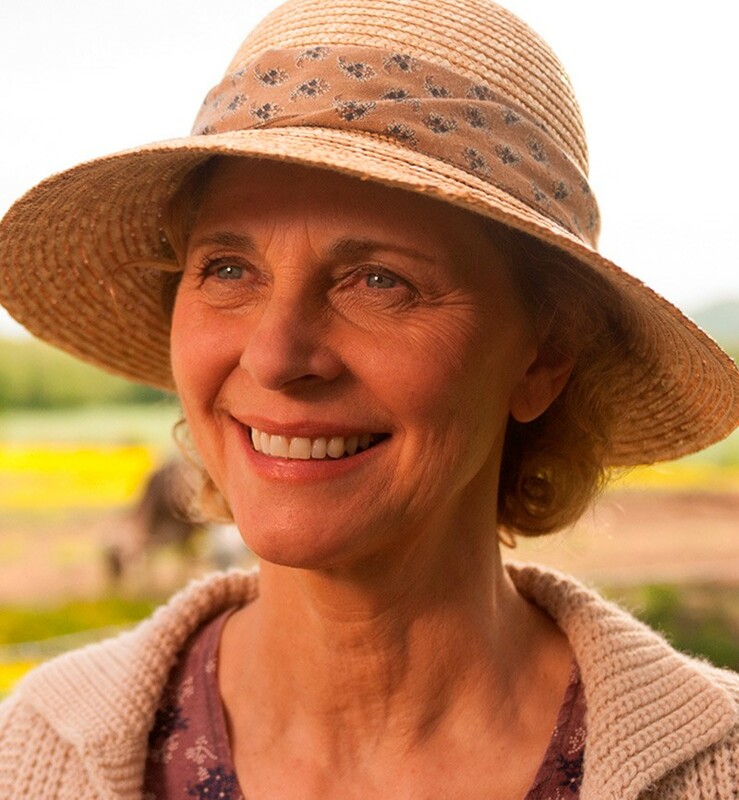 Lindsay Wagner: I play the mom of the male star. It’s a story about two young people in their late 20s or early 30s. My son is a foreman for a very large, beautiful horse ranch in Valentine, Nebraska, and we live there. The young woman is the daughter of a family moved away, was disenfranchised from another family in the town who also has a ranch. There was a family feud between those two families. The young woman was born in another area and never got to see her home. Her parents are now passed on, and she goes back to sell the ranch, but finds herself really loving it and finds roots she wasn’t even really aware of. It’s just a lovely movie about someone experiencing how powerful our roots can be. We don’t even know it sometimes until we encounter an aspect of our family we don’t know about. Melissa Parker (Smashing Interviews Magazine): These Love Finds You movies are based on books distributed by Christian publishers. Would you consider this a faith-based or Christian film? Lindsay Wagner: Well, it’s not as blatant as some others they call faith-based films are. To me, it is in the sense that it’s expressing the values. It’s expressing family values. It’s expressing the fact that people can change and grow and forgive. It’s dramatizing what Christianity is to me rather than just using the words, using the lingo. That’s one of the reasons I loved it. There is a reference to a passage. My character talks about it when she first meets this young girl, and they’re having dinner. She talks about how they got through a very tough time. On the wall, there’s a passage, “we shall receive.” I can’t remember the whole passage, but they keep it on the wall. It gives you an inkling that these are Christian people, but they are living the life instead of talking about it or arguing about it. That’s what I loved about it. Melissa Parker (Smashing Interviews Magazine): I have interviewed the legendary Ed Asner several times. Had you worked with him before? Lindsay Wagner: We were in a movie before, but I don’t think we had any scenes together. This was the first time we worked together in that way, but honestly even in this we don’t have much together. My character talks about his character a lot, so it’s clear we know each other because we grew up in that town together. I know him socially more because over the years we’ve done a lot of advocacy work together, just different things. We know each other a lot more than we’ve worked together. Melissa Parker (Smashing Interviews Magazine): I know you have been critical of how female superheroes are portrayed on TV and in films today saying, “Today’s female superhero looks like yesterday’s male heroes in some tights and maybe a push-up bra,” and that modern superhero projects ignore the “feminine wisdom” that women can bring to leadership roles. Lindsay Wagner: I do want to add, though, that I think they are doing a good job on Supergirl of blending compassion and physical power. Melissa Parker (Smashing Interviews Magazine): It seemed to be the goal of television in the 70s and 80s to show the progressive, independent female action heroes, but did you feel they still didn’t seem to have the same prowess as the male heroes, or was that just a sign of the times? Lindsay Wagner: Well, of course it was a sign of the times. To be honest with you, most of the producing and the writing was being done by men. Women were being redefined in our culture by everybody. We really didn’t even know what it meant. The simple fact that women were even “allowed” to be the pinnacle of a show was a start. I think a lot of women didn’t even understand, to be honest with you, what it meant for a woman to be in power. The masculine is in the man just as the women, but it is more dominant in the man. More of those feminine qualities lead to our actions, lead to our decision making, lead to our follow through with changing the way we do things, and that’s a very big order. It takes time. There are a lot of things that have changed, and other things that haven’t changed, especially when you get into areas where there’s money and control. The status quo is being held onto very strongly by the established thinkers that are in control. It’s going to be interesting to see in the next generation what happens because men and women have both been raised differently than we were, than I was. Our culture is very different today. There’s a lot more permission for men to be sensitive as well as powerful, and there’s a lot more permission today for women to be powerful as well as sensitive. It’s just finding that balance and then expressing it through the way we create. Evolution’s a big order (laughs). Melissa Parker (Smashing Interviews Magazine): Why did you want to act? Lindsay Wagner: I was just a kid at twelve when I babysat for James Best, a family friend who was an actor and acting coach. He coached professional actors. I babysat for him, and he actually encouraged me to join his class. It was like, “Come on. Do something fun and creative.” That’s how it started for me, and I found it really helpful on a personal level. I was funny and demonstrative and seemingly outgoing, but these were artists and could see right through me. When I was in pain, I would tell jokes instead of sharing on an emotional level. They were really cool and sensitive people. He encouraged me to have an outlet for my emotions. I was struggling with some issues, and he knew it. It was interesting. Anyway, they encouraged me to do that. All of a sudden, I was acting with these professional actors. He told everybody, “I’m bringing a kid in. Bear with me.” I truly think it was karma. I don’t think I had much say in the matter (laughs). I wasn’t even asking for it. But I loved it. I wasn’t afraid to share my emotions because I didn’t have to admit they were mine. The first project he gave me was This Property is Condemned by Tennessee Williams, about a little girl that lost her family and was kind of living on the land by herself. There was a lot of emotional stuff there to play. That’s what started things. But he told me that as an adult I would make a better actor and would know when the time was right. Melissa Parker (Smashing Interviews Magazine): You have starred in many TV movies about child abuse, family violence, breast cancer, among many other issues. Was that by choice? Lindsay Wagner: Oh definitely, yeah. I actually wanted to be a psychologist. The human potential and emotional thing has always fascinated me. I was very dyslexic when I was young, and they didn’t know anything about it. I tried to go to college, but it was very difficult, so I gave it up and got on with my life. I could read things on my own at my own pace, which I did. I had quite an appetite for learning about that stuff, so I did it on my own. When I went into this business and decided to go into it professionally, it wasn’t until I was twenty-two. I found it such a wonderful opportunity to talk about social issues. Having become so popular and having so much power in the business with the popularity of The Bionic Woman, I was able to get a project done that they really didn’t want me to do back then. These were issues that they were afraid to talk about in entertainment because programs were sourced by companies that were advertising products. That’s how television worked. They were always afraid they’d offend a sponsor’s audience or whatever. But when I came out, at least they knew I’d be watched a time or two, so they let me try some. I always felt like the networks were underestimating them. There were even companies who were afraid to do stories on more important issues of human struggles. But that’s how that came about. They saw that people liked the movies. They didn’t turn them off. They came back for the next one and the next one. It didn’t take the companies long to realize that there was a market for them in that generation, and people were not going to turn the station. Then it became a whole big thing, and I started doing more and more of them. Melissa Parker (Smashing Interviews Magazine): Tell me about your work with the “Quiet the Mind and Open the Heart” workshops. Lindsay Wagner: I was a survivor of domestic violence when I was younger. Our culture back then was very much into, “That’s the way people are.” I didn’t believe that. That was not my experience, so I studied. I’m still studying the mind and spirit and how all that stuff works together, even studying different cultures. For thirty years now, I’ve been the honorary chair of ICAN (Inter Agency Council on Child Abuse and Neglect). Through them I met a woman who had put together a program in the Los Angeles County Jail system that helped domestic violence offenders reconnect with their families. They could choose to go through the program for their last six weeks of their incarceration. I was so moved by it. It was just wonderful. They’d bring their families to this support group. I did that for several years at the jail. It’s so interesting because no one is exempt from these kinds of issues whether you are Christians or Muslims, Americans or immigrants. These people thought it was a life sentence to be like that and to have that dynamic in their families. Some friends came to see what we were doing there, and it was suggested that I do it from my home with friends and family. So it was kind of an evolution. A church in Idaho asked if I would do one. Then it just went viral. People invited me everywhere. Melissa Parker (Smashing Interviews Magazine): Are there other upcoming projects? Lindsay Wagner: There’s one that I don’t have an airdate for, but it was for the Pixel network. It’s a lovely film called A Change of Heart. I think it’s a really sweet film.